Health Benefits of Shiso (green or red): anti-inflammatory, antioxidant, antiviral, antibacterial, high in iron, calcium and carotene (10 X more than that of pumpkin), good for respiratory tract and those with asthma, improves immune function, excellent for stomach aches and digestive upset. Often used in Japan to treat food poisoning due to high levels of rosmarinic acid which stops bacteria growth. This drink is much like making iced tea. The amounts of sugar and even tea will vary based on your own individual tastes. Shiso has natural preservative qualities and can be kept as a concentrate for making drinks in the refrigerator for months without going bad. You can also freeze the Shiso juice concentrate so that you can enjoy anti-inflammatory drink all winter long. Bring a pot of about 10 cups of water to a boil. While it is boiling strip the leaves off the Shiso stems. Then add the leaves to the water once it boils. Turn off the heat and top with a lid and let steep for 30 minutes. The water should turn brownish and the Shiso leaves will look more green than red now. Strain out the Shiso leaves. Be sure to “squish” out all the juice from the leaves as it holds on to much of the Shiso flavor and coloring. Next, while it is still luke warn add in your sugar to your taste. Then add in your vinegar or lemon juice. When you add one of these (I use lemon juice and some vinegar) the drink will turn a brilliant red color. Taste it and if you want more sugar then add to it. You can drink the Shiso juice as is but it is very strong. I recommend diluting it with some water. 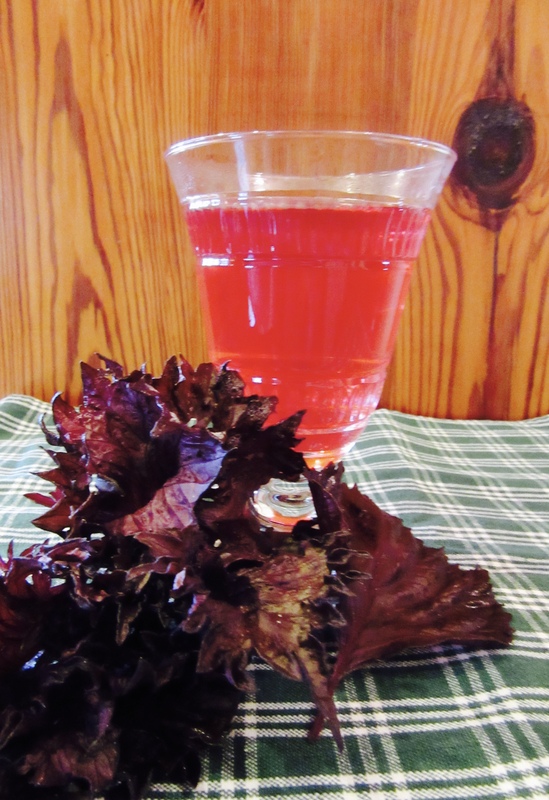 I like to use the Shiso concentrate and add some sparkling mineral water to it for a refreshing summer drink. Remember that part of the benefit of Shiso is that it is super anti-inflammatory. So if you are trying to use this drink for reducing inflammation in your body then you should keep the sugar to a minimum, as sugar is inflammatory.